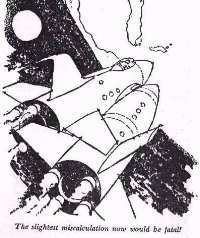 Near the very end of this book, Tom Swift rescues the AstroDyne rocket with his Challenger. To the top is the picture, located at the very front of the book, which depicts this rescue. There is only one problem with this picture: the rocket shown is NOT the Challenger! 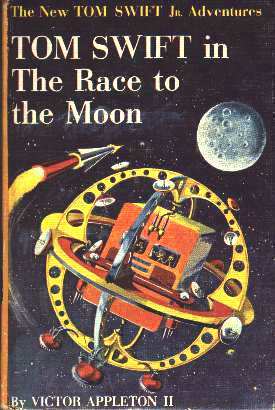 To the right is the cover of "Tom Swift in the Race to the Moon", which depicts the real Challenger. There are two major, amazing inventions in this book, and I will deal with them one at a time. The biggest (and most expensive) invention listed in this book is the Megascope Space Prober. The Megascope Space Prober is basically a radio telescope. It does differ from modern radio telescopes, however, in one area: instead of sensing sensitive radio waves emitted by distant stars, it uses a special kind of radio wave to "scan" the surface of different objects and thus create a picture. "How's your 'Window on the universe' coming, son?" Mr. Swift inquired, his eyes twinkling. "Still in the planning stages," Tom replied, "although I have my high-gain signal amplifier worked out." Bud grinned. "It's still sort of a Greek puzzle to me, skipper. You mean this rig will let us see things in the universe that are way beyond rage of the biggest observatory telescopes?" Tom nodded. "I hope so. Actually it won't give us light images of heavenly bodies such as we see with an optical telescope. Instead, we'll be scanning outer space with a high-powered radio signal--and the reflected signal will 'paint' a picture electronically on a cathode-ray tube." "I get it," Bud said. "Like seeing a transmitted picture of the star on a TV screen, eh?" "An exciting idea," Mr. Swift said enthusiastically. "Imagine peering into every corner of the universe--seeing stars and galaxies we never dreamed of before! This could be your greatest invention yet, Tom." Ö"Got a name for this Mighty Eye?" Bud asked Tom. "I've decided to call it a megascope space prober," the young inventor said thoughtfully. "'Mega' stands for 'million'--or at least 'much greater'--and 'scope' stands for 'seeing' or 'viewing.'" "Whew!" Bud gave an awed whistle. "Seeing a million times farther than ever before! Nice going, Tom!" Both men watched with interest as Tom explained his small-scale pilot model. Besides the signal-generating equipment and amplifier, the device had a curious-looking antenna. It was composed of a series of wire rings connected together into a tubelike framework. Arv Hanson looked puzzled when Tom called the setup an "anti-inverse-square-wave generator." "Say that again," he murmured, frowning." Tom grinned. "Well, you've heard of the inverse-square law," he began. "It says that the strength of a signal is inversely proportional to the square of the distance from its source." Using chalk and a blackboard, Tom dashed off a simple example. "If twenty units of light are received two feet away from an electric bulb, then only five units will be received at a distance of four feet," Tom explained. "That's because light and other forms of energy travel in spreading waves so that you pick up only a smaller and smaller bit of the signal the farther away you are," Tom went on. "But I call my generator an anti-inverse-square type because the signal doesn't get weaker. It stays focused in a constant beam." "Suppose we want to see the moon close up," he began. "We beam out two signals at the same instant--but with a tiny difference in wave length." Tom wrote down his example. "One signal would have a wave length of say, 100 meters, the other of 100.0001 meters." He did some hasty arithmetic. "As you can see, the waves will become more and more out of phase as they travel along though space. By the time they reach the moon, they'll be exactly 180 degrees out of phase--which means they cancel each other out. And this gives us our terminal point for scanning the moon's surface." "You say you're goin' to get sky pictures with that thingamajig when it's all done?" Chow asked. Tom nodded. "This is the last part of my space prober. It'll be sort of a radiation lens." "Like on a camera?" Chow scowled and scratched his bald head in perplexity. "Brand my cactus salad, I thought lenses were made out o' glass!" "That's right. I was just suing a figure out speech," Tom explained. "What I meant was, this will serve the same purpose as the lens of a camera or the objective lens of a telescope. Here, I'll show you." Using chalk and a blackboard, Tom sketched a simple diagram of a camera to show Chow how the lens bent the light to form an image on the film. Then he diagrammed the way in which his prober would beam three radio waves out into space. Two of these would cancel out at wave terminal point--whatever distance the viewer wished to see. "In other words, they give us our point of view," Tom said. "And the third wave signal acts as our lens. It picks up an 'image,' you might say, from the light rays reflected by the object we want to look at--and transmits the image back to our receive, so we can see it on a screen." Chow circled cautiously around the workbench, squinting at the electronic apparatus from all angles. "Where is this here 'third wave signal' you're talkin' about, boss?" Tom smiled. "You won't be able to see any of the three waves that the prober beams out into space, Chow," he explained. "They're invisible, just like all radio signals." "Well, I'll be jing-whistled!" Chow eyed the young inventor in amazement. "An invisible camera lens that makes pictures you can see! Tom, that's remarkable!" How practical is it to build a Megascope Space Prober? Not very practical, to say the least. The entire invention hangs on Tom's "anti-inverse-square-wave" -- a wave that defies everything known about physics by exceeding the speed of light and not diminishing over distance. I know of no bylaw that would permit such a wave to exist. Maybe Tom invented a machine that could send waves through the imaginary realm of hyperspace or maybe he found a way to easily generate exotic nuclear particles (such as neutrinos) that can exceed the speed of light. At any rate, with our current knowledge of physics, building a space prober is entirely out of the question. However, it might be possible to build a Megascope Space Prober that works with normal radio waves. Such a device, though, would be expensive, rather costly, and practically useless. After all, if the images aren't in color and aren't real-time why bother with all the expense? Ordinary light reflected from objects is good enough for most people. What are the properties of Tom's "anti-inverse-square-wave"? The unique and mind-boggling wave that Tom invented has some interesting properties: it can exceed the speed of light; it is invisible; it can be generated fairly easily; it can be used to generate full-color real-time images of very distant objects; it does not cope very well with certain types of gases and radiation, and it does not diminish in power over long distances. How did Tom use or market the Megascope Space Prober? First of all, Tom had a space prober assembled and installed at Swift Enterprises. Secondly, he had one installed on his amazing spaceship Challenger, and it is highly likely that he put one on his Cosmotron Express. It does not appear, though, that Tom tried to market his prober in any way, despite the fact that the general public knew it existed and was excited about its capabilities. Proof of this, in fact, is in the book Tom Swift and his Subocean Geotron. In Tom Swift and his Subocean Geotron, Tom needs some scientists to study a strange spaceship that is hovering over the ocean, so he calls in some ecastic scientist's to use his Prober (the only device that could get a really good view of the object) -- thus suggesting that he had the only one. How much impact would a Megascope Space Prober have on civilization? It would have a lot of impact in the field of astronomy and space exploration. The reasons are obvious: modern-day telescopes are not only limited to fairly large and bright objects, they also can't show real-time images of something. A telescope, then, that has infinite range, generates real-time images, is in true-color without computer enhancement, and has superb resolution would be an astronomer's dream. Space probes to map out the surface of a distant planet would no longer be necessary -- simply warm up the prober and turn it on Pluto or Alpha Delta 9 and you have a perfect map, down to the pebbles in the sand. It also might be possible to alter the beam of the prober so that it can give infrared (heat) information or spectral analysis of rocks. It might also be possible to change the wave of the prober so as to generate images of a planet's core, for example. If this is indeed the case, then scientists will be able to get all the information they need from a distant planet without leaving the comforts of the observatory. 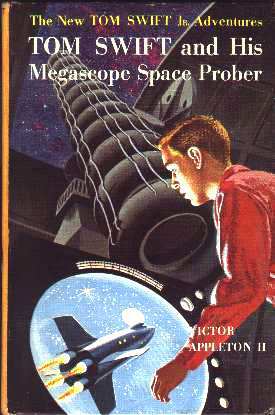 The Megascope Space Prober would also be the last word in spy satellites. It would be a spy's dream -- you could, theoretically, have a from-orbit resolution that can see the finest grain of sand. Hook it up to a 3-D Telejector, and you've got a winning combination of fantastic resolution and 3-D images. The second major invention listed in this book is Tom's Private Ear radio sets. The Private Ear is basically an eavesdrop-proof radio that, because it uses Tom's anti-inverse-square-wave, can break the light barrier and permit real-time communications between such far-away places as Earth and Pluto. ÖHe was eager to try out his plan for using the anti-inverse-square-wave principle in a new kind of radio. Two separate receiver-transmitters would be needed for the experiment. The idea was so clear in Tom's head that he plunged into the job of constructing the units at once, with only rough preliminary sketches or circuit diagrams that he had already drawn. "The radios can be very small and fairly low powered," Tom reasoned, "since they'll transmit on a very narrow beam of radiation." Each would need a small computer in its base. Tom produced these quickly by converting two of his "Little Idiots"--amazing midget electronic brains that he had invented for his expedition to the phantom satellite. The new radios, like his space telescope, had extremely sensitive amplifying circuits that would have to be supercooled by liquid helium. This meant that the circulating tubes and housing must withstand ultra high pressures. "That'll make it tough to keep the sets very light in weight," Tom mused. Suddenly the answer came to him. "Durastress! Why didn't I think of that before?" Durastress was a plastic he had invented that had fantastic properties---far stronger than any metal of comparable lightness. Tom had used it to contain the revolutionary atomic dynamo in his triphibian atomicar. The plastic could be worked easily, and Tom soon had the radio housings and helium coils constructed. Next would come the job of installing the electronic circuitry and chassis. What're these, Tom?" he inquired. "Your latest brain children?" "Yes, and they're twins. I designed them for a special kind of radio communication which should be pretty useful in our space work." "Well, don't keep me in suspense," Bud pleaded. "What's the angle?" "With radios like these," Tom said, "we won't need to use a scrambling device for secrecy." "Because no one else in the world can eavesdrop on our conversation." Bud looked startled. "Are you kidding?" "No, it's on the level," Tom replied. "Oh, it's barely possible that someone might poke his antenna exactly into the path of our two-way beam. But it's a zillion-to-one chance--and then we would have instant warning, because it would break our two-way contact." Bud settled down on a stool again, his eyes glinting with interest. "Tell me more." Tom explained his anti-inverse-square-wave principle by which a radio signal could be transmitted any distance in a single, self-enclosed beam. "When you first start broadcasting," Tom continued, "the radio will transmit in the usual fashion. But as soon as you make contact with the station you're calling, the anti-inverse-square-wave effect comes into play." "By means of the computer in the base of each radio, the two sets would instantly 'lock' onto each other. From then on, the transmission would take place in a very narrow beam of radiation--with no other listeners able to tune in." Tom proceeded to hook up a system of tubing from a helium cryostat to one of the radio sets. "What's that for?" Bud asked. "The amplifying circuits will be working with such delicate signals that they have to be bathed in liquid helium," Tom explained. "Otherwise, unless they're supercooled, the molecular motion sets up too much noise." "Whew! I guess that's about as delicate as you can get, eh?" Tom grinned. "After I get the set loaded with coolant, there's a small cryostatic compressor inside that will keep the helium liquefied whenever the radio is in operation. Sort of a midget-sized refrigerator." Update! I recently received a note with some information regarding a real-life Private Ear radio, and after getting permission from the author of the note I have decided to post it. Here it is! Looks a lot like the private ear radio in the sense that you can't `tap' the communication channel. I believe that AT&T has demonstrated a protected channel using fiber optics for 1 to 2 kilometers. In TS's invention, since the communication occurs in a tight beam, the tapper would have to insert an antenna directly in the path of the beam (very, very unlikely) and this would immediately block the signal from continuing to the receiver. The closest I can think of this today is to use a very narrow laser beam. There would be some spreading but probably not enough to make detection likely. For quantum crytography, the tapper introduces extra randomness into the channel that can be detected at the endpoints. The second URL explains this some what better. It looks like Tom's invention might be more realistic than I had expected! Tom knew what he was doing after all. In the book, Tom's cryostat goes haywire and the liquid helium crawls upward out of its container. This actually can happen. When helium becomes a liquid at around 4 degrees above absolute zero it turns into a superfluid. A superfluid is a fluid with some remarkable characteristics, one of which is indeed "spilling upward".